Leave that sad deli salad behind and eat a (power) lunch like real New Yorkers do. 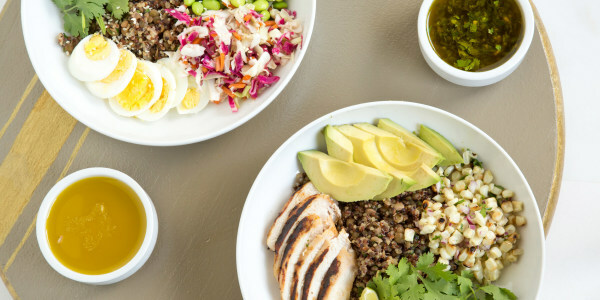 The international fast-fresh chain Pret a Manger is every Manhattan office worker's favorite way to get a big boost of energy, serving up super healthy and crazy tasty "power lunch" bowls loaded with healthy, delicious ingredients. Want one? We know you do! The great news is that they're almost as easy to make ahead in your own kitchen as they are to pick up in the store – and you’ll save a bundle too. With a protein-packed base of lentils and quinoa, this bowl can be topped with anything you want — take our Pret-inspired suggestions or choose your favorite vegetables, nuts, meats, and cheese to make the power bowl of your dreams! Whisk 1/2 cup white vinegar with 1/4 cup sugar together until the sugar dissolves. Stir in 1 cup bagged coleslaw mix, then let sit at room temperature for 1 hour or up to 3 hours. Drain and serve. Use lemon juice and 1 small minced shallot to make the vinaigrette. Whisk in the zest of 1 lemon and 1 teaspoon Dijon mustard before whisking in the olive oil. Use sherry or red wine vinegar and 1 small minced garlic clove to make the vinaigrette, and stir in 1 heaping tablespoon chopped fresh parsley and 1 heaping tablespoon chopped fresh cilantro or oregano before whisking in the olive oil. Use balsamic vinegar and 1 small minced garlic clove or 1 small shallot to make the vinaigrette. Casey Barber is a freelance food writer, photographer, and recipe developer, the editor of the online magazine Good. Food. Stories, and the author of Pierogi Love: New Takes on an Old-World Comfort Food and Classic Snacks Made from Scratch: 70 Homemade Versions of Your Favorite Brand Name Treats.